Small Solutions, Big Ideas (SSBI) and Open Planet Education Network (OPEN) are partnering to launch a series of educational programs globally that engage students in real-world challenges. OPEN and SSBI are joining together to expand the collaborative work that OPEN’s multi-player online adventure games add to the rich curriculum of the One Laptop per Child (OLPC) Sugar learning tools. This opportunity empowers youth as a connected community. This learning model is inspired by Seymour Papert, regarded as the father of constructivism and technology in education. Following this summer’s successful launch of our Phase 1 pilot program linking schools in Kenya and South Bronx, SSBI and OPEN are developing a semester-length curriculum, Kids Worldwide Unite: Save the Black Rhino. Based on lessons learned during the pilot, Phase II will focus on the illegal wildlife trade of black rhinos. Students will evaluate policies and make recommendations on how to combat illegal international trade networks and better protect rhinos’ habitats. Students will use education and social media to generate awareness of the issues. SSBI and OPEN are seeking support for Phase II Kids Worldwide Unite: Save the Black Rhino program in support of the program in our founding classrooms in Nairobi and Bungoma, Kenya and NYC. These funds will facilitate comprehensive curriculum, professional support and additional technologies for the second semester of this school year starting February 2014. On December 4, 2013, SSBI and OPEN are hosting an educational discussion and celebration in honor of Seymour Papert. We welcome sponsorships of $5,000, $2,500 and $500 for this event. 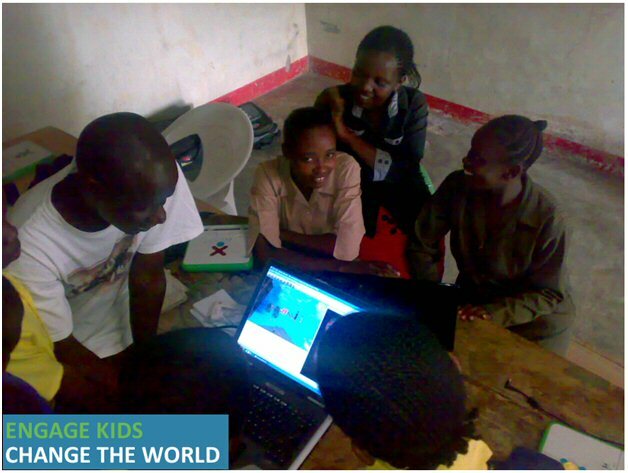 Connected teams of children and online game sessions with Save the Black Rhino. Funding will provide 20 XO laptops, 8 Windows laptops, media, connectivity and communication supplies to expand student engagement. Funding will also support training, the management of the program, and provide stipends for school-based teachers and coordinators. Funding will provide the development of the endangered species curriculum and the support for expanded live game sessions of Save the Black Rhino game, inter-classroom coordination, program tracking and evaluation, social media support, additional office and support expenses. In addition, funds will be allocated for the development of a citizen science app supporting Save the Black Rhino for XO and Android tablets. The curriculum and programs will remain with the schools and communities as permanent resources. Students will collaborate in game playing, communication sessions, and citizen science programs to share lessons learning and best practices, research outcomes, and problem solving strategies around the global issue of the imminent extinction of the Black Rhino. Skills used in research and game simulations and assessment of Rhino survival. Small Solutions, Big Ideas believes access to technology helps bridge the education gap and achieve the goals of the UN BDGs. Bringing technology to children is now achievable through the OLPC XO design and availability. SSBI is reaching children in rural isolated communities in Africa and giving them access to high quality, innovative technology learning tools. SSBI is mentoring teachers, encouraging them to integrate technology into their lessons. SSBI is helping build constructive curriculum models that help children as thinkers and problem solvers. SSBI has built a network of teachers, schools, community leaders and learning centers and will now leverage this community to connect kids worldwide via OPEN so they can address critical challenges in the future. This generation of children has already shown that they can begin to play a role in solving the world’s problems before they finish schooling. Tapping into this potential – by helping children – provides a sustainable future for their and our communities. OPEN is a leading provider of online multiplayer adventure learning games and related online education programs. Our 3D role-playing games engage and inspire kids worldwide to develop critical thinking and problem solving skills using educationally and emotionally rich storylines. Contact Sandra Thaxter today to confirm your sponsorship of this amazing educational initiative.